If you haven’t been following the Kickstarter campaign for the Blood of Kings audio books, amazing things have been happening! Within the first twelve hours you guys raised the $2500 to fund the By Darkness Hid audio book. I was floored! And over the past few weeks we’ve now surpassed the $5000 mark, reaching our first stretch goal to fund the To Darkness Fled audio book. That means we will for sure have audio books of the first two books. We are now working toward the stretch goal for book three. And we have eight days left! Come support this project. This will be the best time to lock in a deal for all three Blood of Kings audio books at the $25 support level. That’s $8.33 per audio book. What a deal! Also, the test set of the limited 10 year anniversary edition Blood of Kings trilogy (finally!) arrived, and they look amazing. I am so excited. Here is a video of me showing them off. I think they look fabulous. Like I said in the video, I need to make some adjustments to them so that they will be perfect for those of you who backed at the hardcover book level! These hard covers will only be available as part of this Kickstarter campaign, so if you want a set of these pretties, you can order your limited edition hard cover books on the Kickstarter home page. International readers, I have them listed as USA only, but if you really want to order a set, please email me and we can talk about shipping costs. I’m working with a few international people on this already. Thanks for your support, everyone. Keep on reading! Today only, the ebooks of Storyworld First and Punctuation 101 are .99 each. Click on the links below to find the book in each store. Building a storyworld? Where do you start? This book can help you. Oz, Wonderland, Narnia, the 100 Acre Wood, Neverland, Hogwarts, the United Federation of Planets, Westeros, Middle Earth, Alagaesia, Terabithia, Gotham City, Jurassic Park, Fablehaven, and a galaxy far, far away. These fictional places have become real in the minds and hearts of readers. These are storyworlds that someone invented—someone who was once like you, learning to tell stories, learning to write, and dreaming about publishing a novel. Whether you’re starting from scratch or are looking to add depth to a world you've already created, Storyworld First will get you thinking. Includes tips on the following worldbuilding subjects: astronomy, magic, government, map-making, history, religion, technology, languages, culture, and how it all works together. Want more books? Click here to see eight more writing crafts books that are on sale each for .99 too! Check out the image below to see what’s on sale. Today is the day! *dances* After four years of hard work, the final installments of the Kinsman Chronicles, King’s War and Warriors of the Veil, have released into the wild. King’s War is my 20th book. It feels surreal to hold this one and to look at the stack of author copies and remember what it took to finish. I have a new respect for authors like J. R. R. Tolkien, Robert Jordan, Brandon Sanderson, Brent Weeks, and Ken Follett. And I can sympathize with George R. R. Martin, who has yet to finish his epic series. I get it, George. There’s a lot to tie up. A lot. And if you haven’t read these books yet, I’m having a sale. So this is a good time to grab them, if they’re been on your list. You can get all three autographed paperbacks for $30 through June 30, 2018, while supplies last. Click here to visit my bookstore. This is a different party from the online Facebook Launch Party I’m doing with Gillian Bronte Adams (click here for details on that one). If you live in the Portland, Oregon/Vancouver, Washington area, please try to come. We’re going to have a lot of fun and prizes and cake. Also, I will only have the three Kinsman Chronicles books for sale at the event. You guys, I received this gorgeous King’s Folly fan art from Rebeka Borshevsky. Is she talented, or what? I love, love, love the hairstyles. How accurate do these appear to the characters you pictured in your heads as you read the book? A few weekends back, I went to my son’s FIRST Robotics competition, at which I volunteered for field reset. The job isn’t difficult, but two days on my feet for 8-10 hours each day wore me out. And I must have caught something new, because today I am sick again. Boo. 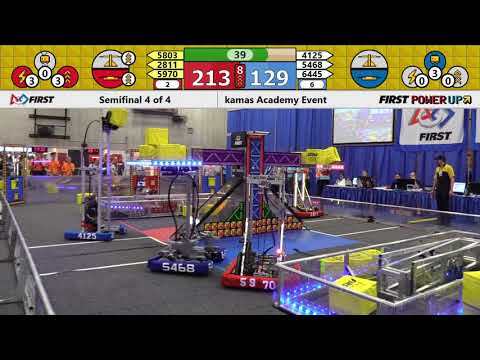 If you’re curious what goes on at a FIRST Robotics competition, below is a link to one of our semi-final matches. Our team (2811) was the second seed captain, which is a pretty good place to be. We earned second place in the tournament. If you look carefully, you can see me, sitting on a chair in the lower right-hand corner of the video. I’m wearing an orange PAC-MAN ghost smock. At the end of the match, I get up and open the lower right-side gate, then come onto the field to help clean up. Also, my son was working the camera a few steps away from me. He’ was wearing a navy blue jacket. We were at this competition all day on Friday and Saturday. And on Saturday, we even helped tear down the field. Me and another mom folded ALL those blue curtains you see hanging in the back. That was a lot of curtains. Have you ever been to a FIRST Robotics competition? My son, Luke, the camera man. My view of the field. The field from the stands.